Once you create Group Sets and Groups, each Group has its own group site that is created in order for the students within the group to collaborate together. The purpose of this document is to show instructors and teaching fellows how they can access the Group’s Homepage. 1. From the Course Navigation, Click on “People”. 3. Then, click on the gear associated with the group and select “Visit Group Homepage”. 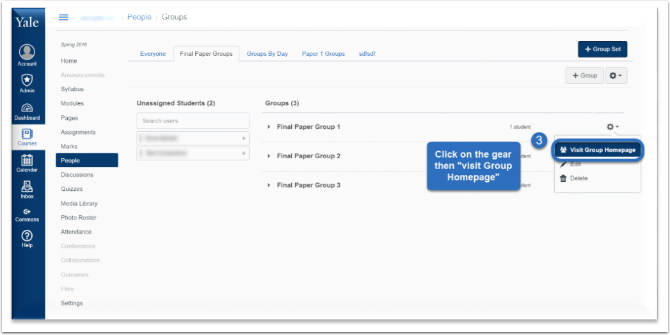 Note: The students will have the access to use all the tools within their specific group site, including posting announcements, uploading files, and creating pages. Next: How do I Create Groups?